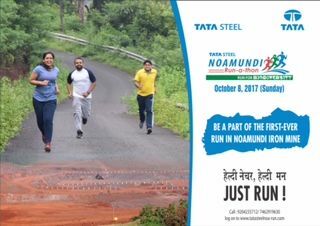 Noamundi: The registration of Tata Steel`s first-ever run at Noamundi Iron Mine called “Noamundi Run-on-thon” closes on September 30, 2017. As this event is first of its kind run in Noamundi and the theme selected as “Run for Biodiversity”, it is attracting all sections of society. The enthusiasm and interest among community and people residing in and around Noamundi is evident, as more than 3200 have registered so far. The event has created a lot of buzz and started gaining popularity. To facilitate registrations smoothly, an online dedicated link www.tatasteelnoa-run.com has been opened. Also registration kiosks have been positioned in schools, colleges and villages for manual registration. An offline registration counter has been opened at Noamundi Sports Complex, which will be open to all from 10:00 am to 5:00 pm everyday till the process ends. The run will kick-start from Noamundi Sports Complex with the first race scheduled at 6:30 AM on October 8, 2017. There will be different events for various categories of runners. Apart from the 10km run for elite runners, there will be a 7km run for Men and Women, a 5km run for Boys and Girls from Schools and Colleges and a 2km run for Persons with Disability. The reporting time for all races is 6 AM.